Although police officers arrest people from all walks of life on charges of DUI in Los Angeles, it’s not often that those DUIs relate directly to a job. But two separate incidents—one resulting in fatal injuries—demonstrate how people in some occupations may be more at risk when it comes to driving under the influence. The first case involves a Pennsylvania nurse who forgot that he was on call to assist in emergency surgery. Richard Pieri had just returned home after enjoying time off at the Mohegan Sun casino; he reportedly had drunk at least four beers when he got the summons to go to the VA Medical Center near Wilkes-Barre, Pennsylvania. A surveillance video at the hospital showed Pieri bumping his vehicle into a concrete barrier at the parking lot before he headed up to assist the surgical team. (One of his jobs was to monitor the patient’s vital signs during the operation; fortunately for both the patient and Pieri, the surgery went well.) Coworkers noted that Pieri had not seemed his usual self during surgery and reported the incident to management. 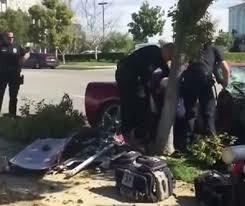 Police later became involved, charging Pieri with reckless endangering another person, DUI and public drunkenness. In Ontario, California, a man driving under the influence of prescription drugs killed a CarMax salesman who was taking him on a test drive of a Corvette. The Los Angeles Times reports that Alex Mark Demetro, 28, of Union City, was traveling at a high rate of speed (at least 70 mph) when he lost control of the vehicle and slammed into a tree. The accident killed 43-year-old Warren Smale. Police arrested Demetro on charges of vehicular manslaughter and felony driving under the influence of drugs. Under California Penal Code 191.5, a conviction for vehicular manslaughter can result in up to one year in jail (if it is a misdemeanor) or up to four years in prison if prosecutors can prove that the driver acted with gross negligence in causing the crash. Call Michael Kraut of the Kraut Law Group to schedule a free consultation with a qualified Los Angeles DUI defense attorney. Mr. Kraut is a Harvard Law School educated ex-prosecutor with nearly 20 years of experience and an excellent track record for getting justice for DUI defendants.